Early Intervention - Alper Services, LLC. Industry research shows that only 15% to 20% of claims drive 80% to 85% of your Workers’ Compensation claim costs. The Alper Early Intervention Program quickly identifies your high cost claims with 95% accuracy and rapidly intervenes for significant cost savings. Proactive communication after a work-related injury and throughout the recovery process is critical for maintaining or boosting employee morale. It also acts as a deterrent against fraudulent claims. At Alper Services, we transform people from absent or idle to present and productive every day. Our unique model combines cutting edge technology with early intervention to achieve incredible results. How incredible? Our cost per claim and claim closure rates are up to 40% better than the national average. “High Risk” claims include those employee injuries who are currently at risk of long term lost time. Our Program is based on industry facts showing that “High Risk” claims require a higher sense of urgency. This program intensely manages these “problem claims”, improving outcomes for the employer and the injured employee. The Early Intervention Program reduces the cost of "High Risk" claims! Experienced triage nurse communicates with the employer, the injured employee, and the medical provider within four hours on initial report. Based upon their experience, the triage information, and proprietary criteria, the nurse will determine if the claim has a “High Risk” of becoming more serious. A plan to oversee the medical treatment and get the injured employee back to work in 30 days is created for each High Risk claim. Telephonic nurse case management with regular updates to the employer after each medical visit, including well-being checks to keep you updated on your employee’s condition. The Key is Early Identification of High Risk Claims! Within 4 business hours of a claim report, we deploy our nurse triage resources, to begin addressing underlying issues, ensure appropriate medical treatment and focus on achieving the best possible outcome. 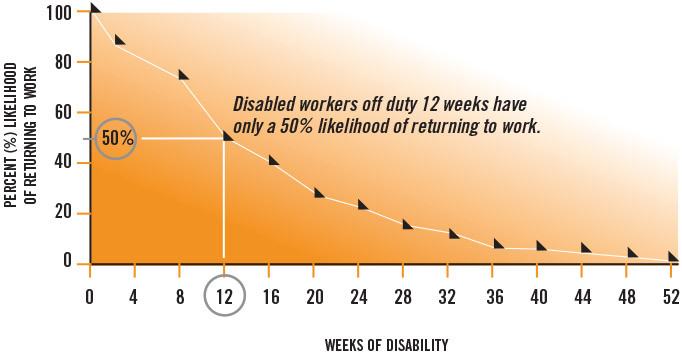 We measure results based on our ability to provide the earliest return-to-work and to life and the lowest costs. We communicate with and coordinate the activities of all participants in the system: injured employee, employer, medical care providers, and the insurance carrier adjuster. This program will improve productive capacity and decrease costs associated with Workers’ Compensation claims and provide you with a significant competitive advantage. The Early Intervention Program provides a filter to quickly identify and manages those claims which typically drive 80%+ of your claim costs. What Does The Alper Early Intervention Program Contribute to the Typical Claim Adjustment Process? For more information on Alper’s Early Intervention program, please call Catherine Higuera, Workers’ Compensation Claims Specialist, at 312.654-4252 or email CHiguera@AlperServices.com.